Countercurrent heat exchange: Intricate networks of blood vessels act as countercurrent heat exchangers to heat blood as it returns from the foot to the body. This steep temperature gradient (yellow arrows) reduces heat loss and saves a tremendous amount of energy. Graphics by Cornell Lab of Ornithology. Adapted from Randall et al. 2002. Click here for a larger image. 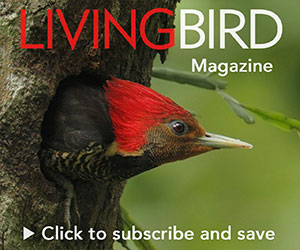 From the Winter 2017 issue of Living Bird magazine. Subscribe now. 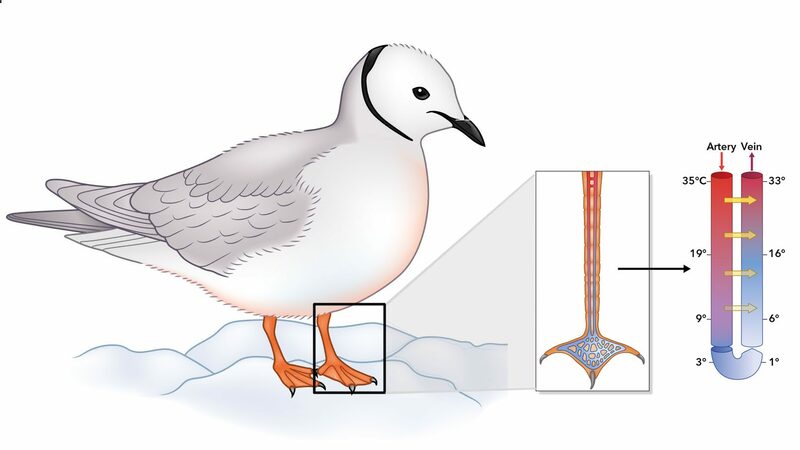 Birds such as gulls and ducks endure long periods of standing on ice via regional heterothermy, or maintaining a core body temperature while allow­ing the temperature of extremities to deviate from the core temperature. Keeping an entire foot warm re­quires a tremendous energy cost. In­stead, these birds allow the foot to approach freezing temperatures. Blood is still supplied to the foot, however, so the birds use a countercurrent heat exchange system—cool blood com­ing back from the foot travels through veins grouped around arteries that are sending warm blood from the body to the foot. Heat is transferred from the warm arteries to the cool veins. This countercurrent heat exchange system is very efficient at maintaining heat in the core. Periodic increases in blood flow allow a little heat to reach the foot and prevent it from freezing. Bird feet can also withstand low temperatures without damage because there are mostly tendons and bones with little muscle or nerve tissue. Since this is not the case for human feet, our own countercurrent exchange systems do not prevent frostbite. The Cornell Lab‘s Bird Academy just launched an online course, Ornithology: Comprehensive Bird Biology, that uses the new, critically acclaimed third edition of The Handbook of Bird Biology as the textbook. Find out more about the book and about the course. How do birds survive in very cold temperatures?